With such a high population in the Valley, there are plenty of legal matters that we are faced with daily. With the large amount of court cases taking place, help from qualified and top rated process services in Surprise are necessary to handle the delivery and serving if court documents. ASAP Serve can quickly and efficiently deliver your legal documents to the right party in Surprise and surrounding cities throughout the Valley. We have process servers who are always up to date in the field, making us the most qualified Surprise process servers for the job! Get a Surprise process server near you who can deliver your legal papers at affordable rates through fast, easy, online orders at ASAP Serve. ASAP Serve is capable of providing you with Surprise divorce and family law document serving so that your documents are delivered fast! 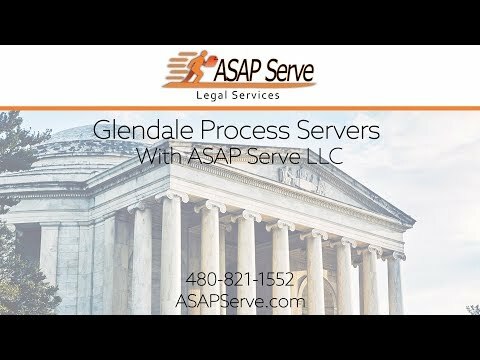 The top rated process servers at ASAP Serve offer fast and affordable service of delivery for attorneys throughout Surprise and cities in the Valley. Surprise legal documents that ASAP Serve delivers throughout the Valley include writs, subpoenas, family court documents, summonses, and more! "I would HIGHLY HIGHLY recommend you use this service if you want quality & a job done right!!" "Would use this particular business again in a "heart beat". Just as fast as they responded to assist me. Most professional and so quick to accommodate my situation. " "Dj and John took such good care of me! They both helped me to feel safe all the way through this processes." "ASAP Serve was a breath of fresh air. They were super friendly and happy to help. They were able to get the service done within one day of receiving the documents." "They truly do know the system and how to get results, but more important they have integrity and character. I wish I would have called them in the first place." Dealing with any sort of legal proceedings can be stressful, and the process servers at ASAP Serve know that getting your documents delivered to the right parties on time can be one of the most stressful factors you have to endure. That is why we consistently dedicate ourselves to providing the most thorough, fast, and accurate legal document delivery in Surprise and surrounding cities throughout the Valley. As the best Surprise process servers in the Valley, ASAP Serve is capable, trustworthy, and affordable, making sure your documents get delivered to the right party at the right time! The Surprise process servers deliver a large variety of documents including summonses, complaints, subpoenas, family court documents, court filings, writs, and any other legal documents that need to be tracked and delivered quickly and accurately. Contact ASAP Serve today for the best Surprise process servers. ASAP Serve offers the most affordable, fast, and streamlined services that yields that most efficient results in Surprise. We strive to offer you the quickest and most thorough process servers who are reliable and can get your documents in the right hands. We dedicate our policies to help put the clients first and guarantee trustworthy, fast, document delivery in Surprise, Arizona. Fast, Reliable & On Time! ASAP Serve is one of the most affordable process serving companies in the Valley, making us a top rated choice for your legal document delivery. With our affordable rates and easy online payments, we also do not charge mileage fees. ASAP Serve also offers quick status reports and updates as well as fast online service requests, making us the best process serving company in Surprise.